Zinc Chrome Powder are used as raw material for diverse industries such as Paint, Coating, Ink, Plastic, Rubber, Textile, Paper etc. 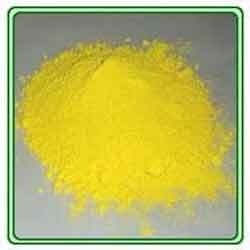 There are various shades or grades of pigments available depending on the requirement. Manufactured from the organic raw material, our Zinc Chromate are remarkable for their effectuality in applications. Scarlet chromes are used as base material in a number of manufacturing units such as paint, coating, rubber and printing. Our rich experience of more than 26 years in the industry enables us to manufacture, export and supply an extensive range of Electroplating Chemicals. The chemicals offered by us include Nickel Nitrate, Sodium Chromate, Potassium Dichromate, Potassium Chromate, Zinc Chrome Powder, Zinc Chromate, Zinc Potassium Chromate, Zinc Tetroxy Chrome, Nickel Sulphate, Sulphonated Castor Oil and Methyl Ester Sulfonate. We manufacture our range using purest quality ingredients in an appropriate proportion. These chemicals are highly liked by our clients because of their purity, high reactivity and safe packaging. We are supported by a team of dedicated professionals who hold rich expertise in the domain. These professionals take extreme care while manufacturing these chemicals. Further, our advanced infrastructure allows us to manufacture bulk range of these chemicals in short time period. We always strive hard to offer our products at affordable prices and in due time.